The County Board voted unanimously Wednesday night to adopt the Rosslyn Sector Plan, a 25-year plan designed to transform this economic hub into a more walkable, dynamic, live-work-shop-play urban center and vibrant gateway to Arlington. 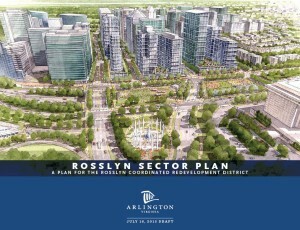 The Rosslyn Sector Plan is the first in-depth review since the Rosslyn Station Area Plan Addendum was adopted in 1992. It comes at a time when central Rosslyn is experiencing its second generation of redevelopment since the County applied its first site plan process there 50 years ago, and as County forecasts anticipate that Rosslyn’s population will continue to grow. The long-range sector plan provides both a vision and a guide to growth and development in the Rosslyn Coordinated Redevelopment District (RCRD), the area that lies within the boundaries of the North Rosslyn and Radnor Fort Myer Heights Civic Associations. Fostering a more balanced mix of land uses by significantly increasing the share of housing and continuing a high-density development pattern to support a varied and intensive mix of people and activities. The County kicked off the Realize Rosslyn community planning effort in December 2012. Throughout the Realize Rosslyn planning process, County planners involved the community in variety of ways from traditional public workshops, outreach events, one-on-one meetings, to more virtual civic engagement such as blog posts, social media and virtual forums to find out what the community believes Rosslyn should look like in the future. Staff responded to hundreds of questions and comments, and fine-tuned the plans based on the public’s feedback. Learn more about the Rosslyn neighborhood. To read the staff report on this item, visit the County website. Scroll down to Item #41 on the Agenda for the Wednesday, July 22 Recessed County Board Meeting. The Board adopted a plan that meets some of the County's highest priorities for public facilities.